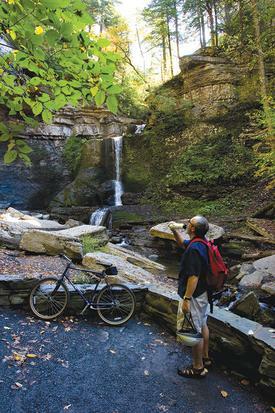 Experience, explore, and enjoy the four seasons of adventure as you hike and bike through Cayuga County and the Finger Lakes Region. Don&apos;t forget to pack your camera, as the views you&apos;re going to see are fantastic! Detailed trail info is available by clicking the links below. Converted from an old railroad bed, this is a 1.6 mile trail through scenic woods, wetlands, and farmland. This park features glacially formed bluffs with scenic vistas of the Great Lake Ontario. Cayuga Lake is the highlight of this ride with historic markers posted along the route that help tell the story of the area from the Cayuga Nation villages to the 1779 Sullivan Expedition. With Emerson Park at the north and Fillmore Glen State Park at the south end of the route, this ride around Owasco Lake is one of the easiest and picturesque around a Finger Lake. Our hiking and biking itineraries provide great hiking ideas as well as attraction highlights and place to stop and eat along the route as well as detailed directions.